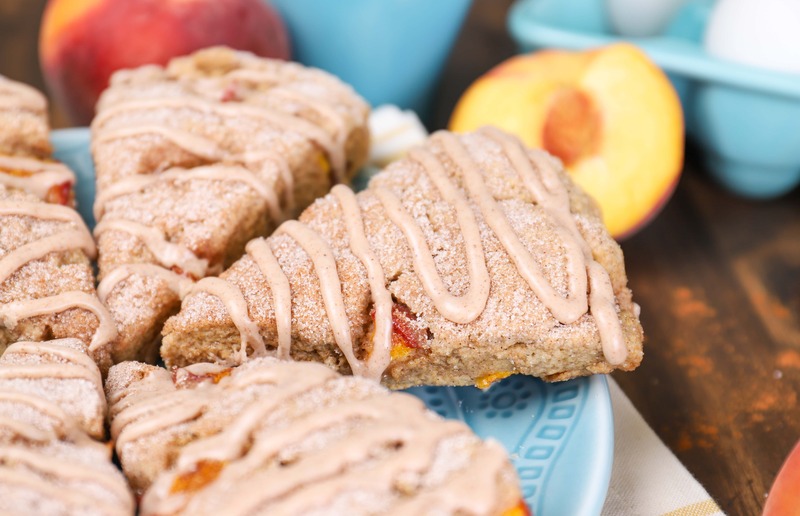 These Peach Snickerdoodle Scones are filled with the warm spices of a snickerdoodle cookie and chunks of fresh, sweet peaches! *Post and recipe from 08/13/14. Updated 07/17/18. I’m sure you’ve noticed that peaches have kind of taken over the blog lately. I just can’t stop eating them. This year they seem especially good around here. However, my husband and I can’t keep up with eating all of pounds of peaches I manage to buy. That means you get more peach recipes! 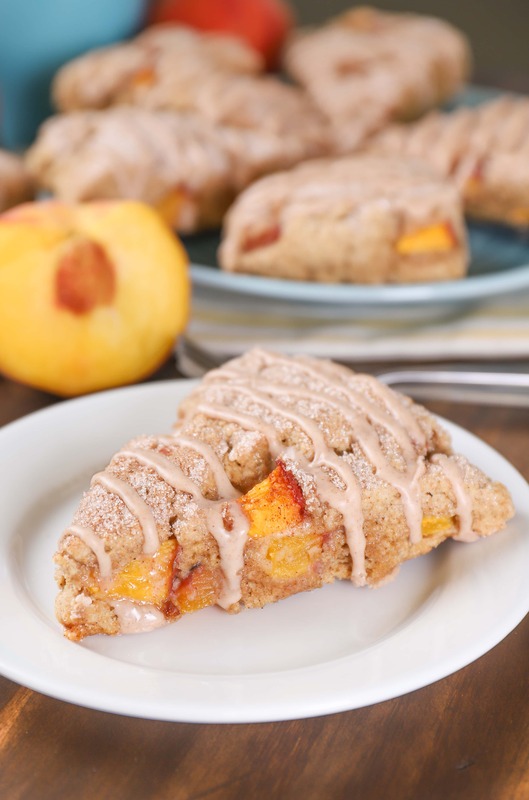 If you find yourself in the same situation with more fresh fruit than you can eat, these peach snickerdoodle scones are a great way to use up some of your fresh peaches! Snickerdoodle scones have been my favorite for a long time. I love having them for breakfast, especially when enjoyed with a fresh cup of coffee. Fresh peaches seemed like a logical addition to them. The insides of these scones are tender and filled with the warm spices of cinnamon and nutmeg. The crackly topping of cinnamon sugar adds more of the snickerdoodle flavor and look to these scones. Chunks of fresh peach add a bit of sweetness and moisture. All you need is your favorite cup of coffee or tea and you have the makings of a great start to your day! Preheat oven to 350. Line a baking sheet with a baking mat or parchment paper. In a large bowl, whisk together flours, sugar, cinnamon, baking powder, baking soda, nutmeg, salt and cream of tartar. Cut in butter with a pastry blender or knives until mixture resembles coarse crumbs. Add milk and egg to dry mixture and stir until just combined. Stir in chopped peaches. Turn dough out until a well-floured surface. Knead 5-6 times until dough comes together. Shape into an 8 inch circle. Stir together sugar and cinnamon. Sprinkle over the top. Cut dough into 8 pieces and place on prepared baking sheet. Bake for 15-18 minutes or until golden brown. Transfer to a wire rack to cool. Stir together ingredients for glaze, adding milk until desired consistency is reached. Drizzle over the top of cooled scones. Allow glaze to harden and serve. Best eaten same day. Store leftovers in the refrigerator. Jessica, these look so amazing. I want the whole batch!! I absolutely LOVE fresh peaches so keep the recipes coming because they are looking great. These look so beautiful! Love using up all those fresh summer peaches. I love peaches..and I love scones. So that makes this recipe a no-brainer. Right? I’m gonna love it! Can’t wait to start my day out with it! You are the scone queen, Jessica! Your scones are always so perfect looking and the best combination of flavors! Oh now this is something I could eat every day. 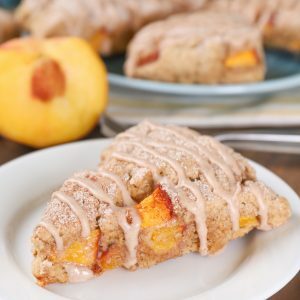 Snickerdoodle scones — not too sweet, and mixed with peaches, I’m sure it tastes kind of like a cobbler! These look amazing! Peach and cinnamon are so good together! I’ve been obsessed with peaches lately! LOVE these scones! 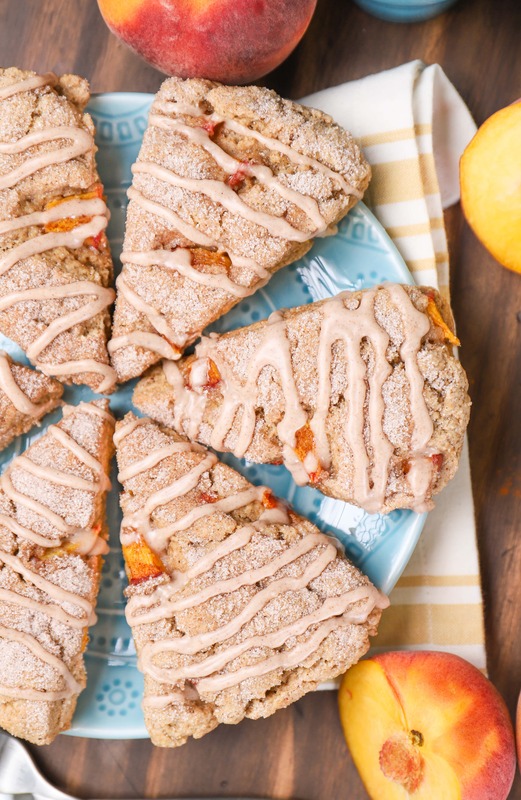 Oh wow – peaches and snickerdoodles in a scone? This sounds so good! Love that cinnamon sugar topping and the drizzle!! oh my goodness – Scones are one of my favorite things to both bake and eat. And with the fresh peaches of the season, I know these are DELISH! Peach and cinnamon are such perfect partners. I haven’t ever had a peach scone before. Looks like I am going to have to remedy that asap! I’m in love with these scones, Jessica! Snickerdoodles are my favorite cookie and peaches are the best, so these sound absolutely amazing! Pinned! Keep the peaches and cream recipes coming. I love that combination. I bet they go great with snickerdoodle flavors too! I love incorporating cinnamon sugar into everything…so pairing it with summer stone fruits seems like a no-brainer! Loving these. Oh yum peaches and snickerdoodle together! I added cinnamon and nutmeg to my peach pie and loved it so I bet these are good too. 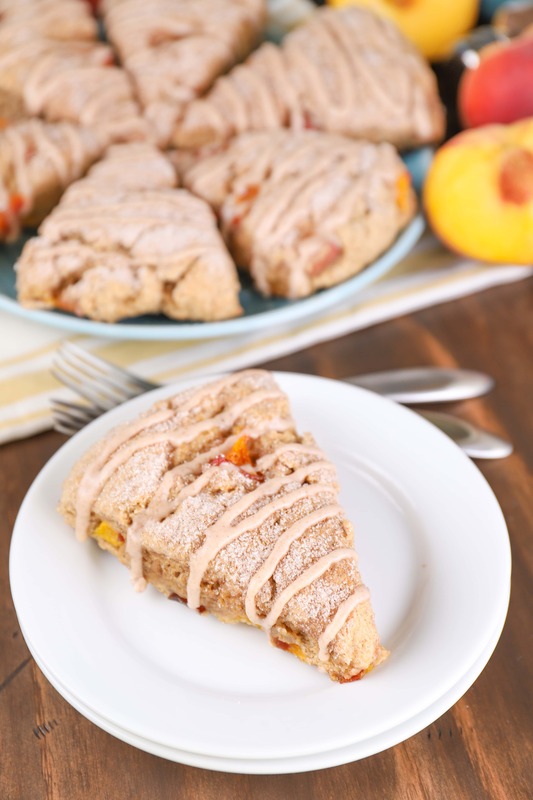 Peach and Snickerdoodle sound like such a dreamy combination! Girlfriend, you can post as many peaches as you want. I never get tired of them!